Every week, a group of friends and I get together to watch the television show, The Walking Dead. By "watch" I mean we make fun of the terrible acting and bemoan the missing parts that made the comic so good. It's a joyful, heartfelt tradition that we look forward to each week, and not much distracts us from this routine. Except, of course, a really good excuse to beat each other up. This week we started our screen session with a local co-op round of The Behemoth's Battleblock Theater in Arena mode. Arena mode features a handful of four-player mini-games, all of which are co-op, two-on-two or every man for himself. We started with "Ball Game." After two hours of passing the controllers, running through various levels, rolling in laughter and punching each other whenever a sweet move went awry, someone suggested we start up The Walking Dead. The response was immediate. "No way. We're playing this." And so we did, all night long. Battleblock Theater is a puzzle-platformer beat-em-up made to play with friends, in person if possible. Each mode shines when sharing every acrobatic feat and violent, horrible death with a loved one. The game's story is adorable, presented by a hilarious narrator that speaks with a tense apathy and dark humor befitting a game about friendship, a friend ship and a prison on an island lorded over by evil cats. The levels are indeed crafted entirely out of blocks, and presented in distinct rectangles and squares, presenting each stage on an actual stage – as the cats' prisoners, players perform these levels for an audience of dapper felines. The campaign in Battleblock Theater allows two-player local or online co-op. Bringing a buddy along for the adventure adds a layer of complexity and broadens the available entertainment options – it alters the physical layout of the levels, allowing players to play off of one another to solve various puzzles. The mechanics involve platformer standards, including double jumps, clinging to poles, aiming leaps onto tiny squares, and some fresh twists with a variety of projectiles, punching and kicking. This is all on top of the environmental hazards like slippery ice, sticky purple goo, spiky death traps and fire blocks that launch players at incredible speeds. Campaign levels have players collect gems and balls of yarn, which can be used to unlock new characters and weapons, respectively. With a friend, players are able to throw their partners onto distant platforms at the touch of a button, pull each other up, stand on top of one another, or have one player activate light beams and bridges while the other gathers gems on the other side. And these are just the helpful things you can do with a friend. We'll get to the less helpful (and more entertaining) things in a minute. For a single player, the campaign is completely accessible, but it's not nearly as enjoyable. It's not that the levels themselves are boring alone, as there's still a challenge to be found in navigating a field of lasers, leaping over rows of spikes, crossing unswimmable pools or taking down pesky cats – it's just more fun with a friend. Playing with another person doesn't necessarily make anything within the game itself easier, more challenging or better, but it alters the experience on the other side of the screen in a tangible way. When I play with a friend, any friend, we not only attempt to blow through levels in record time and collect all the gems and balls of yarn, but we throw exploding saucers at each other, slide-kick each other into bodies of water, or just flat-out punch each other whenever possible. And we laugh the entire game through. Battleblock Theater co-op is the digital manifestation of the love tap, without the risk of permanently injuring one of your best friends. This is co-op designed with people in mind, with a deep understanding of how players react when fighting for the same goal in an adorable platformer. Death is meaningless in Battleblock Theater, a carefree design choice that makes each leap and every "accidental" death as fun and funny as the last. If you die, there's a convenient checkpoint just down the level to pop back up in, and you can try again. And again. And again. The Behemoth has experience in this field, after years of support for Castle Crashers, and its expertise shows. The only real disappointment here is that Battleblock Theater's campaign allows only two players to partake in on-couch punches or online trash-talking. If two players is more fun than one, I want to play with three or four, and really give my friends a beating. But, I suppose that's what the Arena is for. Arena mode offers a lineup of multiplayer mini-games. My friends and I started with Ball Game. The mode was rumored to be the Behemoth favorite, and it was quickly clear why. Arena games allow four-player local or online co-op, and Ball Game is a two-on-two exercise in defense, timing and ball-handling skills. A soccer ball drops from the ceiling and players rush it, attempting to be the first to reach it and carry it to the opposing team's basket, which more often than not is placed vertically in the ground, more akin to a basketball hoop than a soccer goal. It's a simple premise with absolutely ridiculous consequences – my living room quickly dissolved into shouts, insults, curses and screams of frustration, as our two teams ran chaotically across the screen, smacking each other and trying to throw that bouncy ball into the goal. If you want a first-hand look, watch this video of a pretty standard match among my friends, but be warned of foul language and a disproportionate amount of beard. Another game, Horse, is a two-on-two experience that we also enjoy. It takes two square, four-legged animals – horses, presumably – and has each team attempt to steal the other team's steed by riding it from one stall to another. Players earn points as they sit atop the opposing team's horse, scoring a bonus for riding the horse into the opposing stall. This game involves more communication than Ball Game, as one team member can sit atop its own horse to fend off the attacking team, while the other player can attempt to mount the enemy's horse. It quickly devolves into the same name-calling and cursing as Ball Game, though it potentially adds the fun adage, "Score that horse!" into your friends' vocabulary. The remaining Arena games – namely Color the World and Soul Snatcher – don't engender the same fervid guffaws and amiable abuse as Ball Game or Horse, though they suffice well enough as low-key cool-downs. Battleblock Theater also features a level editor. Their is no multiplayer support here, though crafting new levels doesn't exactly lend itself to multiple players or controls anyway. The level editor is extremely accessible, with rows of blocks, traps, colors, backgrounds, game types and world sizes to choose from. The main screen will eventually spotlight community-crafted levels, under the Furbottom's Features tab. 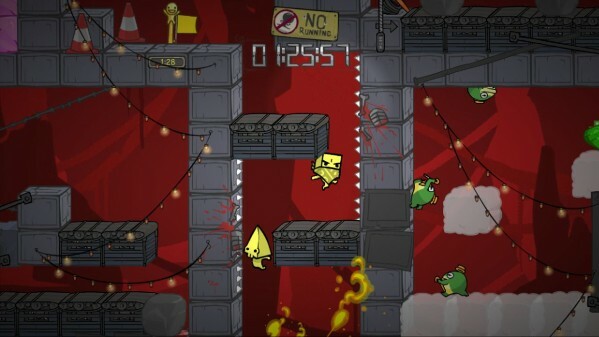 This review is based on an XBLA download of Battleblock Theater, provided by The Behemoth.